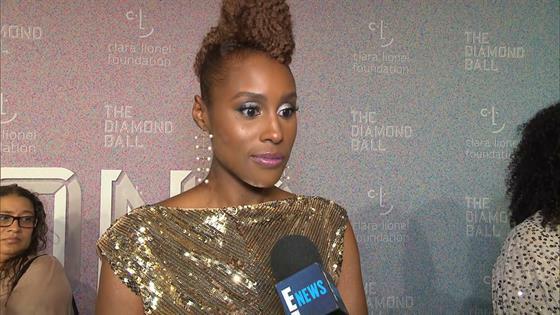 Issa Rae Calls Her People's Choice Awards Nominations "An Honor"
Issa Rae Says PCAs Nomination Is an "Honor"
Issa Rae is celebrating the success of Insecure and she couldn't be more grateful. In addition her Lead Actress in a Comedy Series nomination at the Emmys, The Misadventures of Awkward Black Girl author is up for the Female TV Star of 2018 for HBO's Insecure at the People's Choice Awards. If that wasn't enough, the hit series also scored its own nomination for the Comedy Show of 2018 at the PCAs. "That's such an honor because obviously that comes directly from the people," the Insecure executive producer, writer and star gushed to E! News at Rihanna's Diamond Ball on Thursday. "With the Emmys, that's something that is just huge in the television space so I'm just happy to be on people's minds. That people are watching the show." "Whatever gets promotion to the show and the work we're all doing, I'm grateful," the Stanford graduate added on the red carpet. Who do you think will take home the Female Star of 2018 at the PCAs? Is Rae your favorite this year? Make sure to have your voice heard before round one of voting—AKA cutting the field from 12 nominees to only five—ends tonight. It's seriously time to get voting! Find out all the results when the the People's Choice Awards airs live on E! on Sunday, Nov. 11.